Leisurely days are spent fishing, floating and relaxing in camp on the river. Come in Russia for some of the best Rainbow fishing in the world! Adventurers helicopter to the river that afternoon weather permitting or stay in a hotel and fly the next morning. Leisurely days are spent fishing, floating and relaxing in camp on the river. 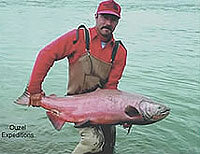 There is excellent fishing for huge Rainbow Trout, 6 species of Pacific Salmon, Kunja and Arctic Char. Rainbows average 24 inches and we-ve caught them up to 33! Kamchatka has large Coastal Rainbow Trout which runfrom 5 to 15 lbs & enter the river from spring on. Summer Run Steelhead or Coastal Rainbows spend most or their lives in fresh water, spending only part of their lives in the ocean. Arctic Char are present all summer. Kunja (east Siberian Char) are great fighters and commonly grow to 15 lbs! Salmon arrival times vary from stream to stream but generally arrive the same time in Kamchatka as Alaska. We fish for King Salmon from late June through July. Silvers arrive mid August and run through October. Chum & Sockeye Salmon arrive in July and August. Pinks run early August through September, but only strong on even numbered years. The Medved River has interesting attractions along the way: huge volcanoes, boiling warm springs and gas springs. It has lots of large Rainbows, a few Arctic Char and a good King run. The river is small at the top and gets medium sized near it's end. It has a lot of islands, is fairly braided & great for wade fishing. The small rocky "gem," the Kartuska River slants downhill with tiny rapids. We first ran it in 2000. It has more Rainbow Trout per mile than any river I've seen in Kamchatka in 10 years. It's a little treasure. We start our trip deep in the mountains floating through a tight valley with huge mountains then finally out onto the coastal plane. Along it's course the river pretty much stays in one piece, not much braiding. Shallow with great wading, you can walk most of it if you like. It has a great Silver run too. The Kapushka River is wide and shallow. It's bottom is gravel and boulders all the waydown, so wading is easy and excellent. Some of our guests have waded down most of the river without even riding in the rafts. Gentle rolling mountains flank the river's sides with distant volcanoes on the horizon. It has one the most beautiful hot springs I've ever seen at one of our camps. The Zupanova River has extraordinary scenery: big rocky mountains, beautiful canyons and the huge, Zupanovski volcano! The river is medium sized to big, mostly in one channel and has lots of side streams to fish. It has huge runs of Arctic Char, many large Rainbows, lots of large Kunja and many Salmon including an excellent Silver run.